Good Shepherd Speech-Language Pathology (SLP) Department Manager Heidii Roberts, is excited to work with a knowledgable team of SLPs and to share her Orofacial Myofunctional Therapy experience with the community. HERMISTON, OR – A love for adventure, the great outdoors, and an exceptional career opportunity is what attracted Heidii Roberts, SLP, to Good Shepherd Health Care System (GSHCS). 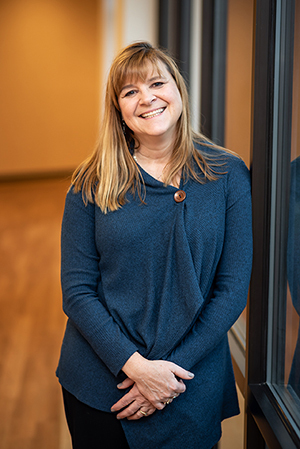 As an experienced Speech-Language Pathologist, Roberts has been practicing for 23 years with the past 10 years owning her own practice in the Portland metro area. But she was ready for a change of scenery. According to the American Speech-Language-Hearing Association, OMT is used to treat orofacial myofunctional disorders (OMDs). These disorders may interfere with the normal growth and development of the muscles and bones of the face and mouth. OMDs may also interfere with how the muscles of the face and mouth are used for eating, talking, and breathing. People who have an OMD may also have problems with talking, swallowing, and breathing through their nose. Some children push out their tongue when they talk, drink, or eat. This is called tongue thrusting or fronting, and it is one type of OMD. For Roberts, living in Eastern Oregon has been a great experience. “Everyone is so friendly here, there’s not much traffic and I’m actively looking for ways to get involved and give back to the community.” Roberts and her husband have two grown daughters, who have both chosen careers in the medical field. Speech-Language Therapy is located at Good Shepherd Health Care System, at 600 NW 11th Street, Suite E-25, and is accepting referrals. For more information please call 541.667.3635. Visit one of our locations. View all contacts in the directory. Fill in the form on contact page.